The nucleic acids were discovered in 1869, until the 1930s, it could be isolated only from animal cells. DNA was usually obtained from animal cells. For many years, DNA and RNA were erroneously known respectively as animal and plant nucleic aids. This belief was dispelled when Fuelgen found that both plant and animal nuclei contain DNA, whereas RNA is present in the cytoplasm of both. Nucleic acids are high molecular weight biomolecules. It can be divided into two types. they are DNA and RNA. DNA is deoxyribonucleic acid. 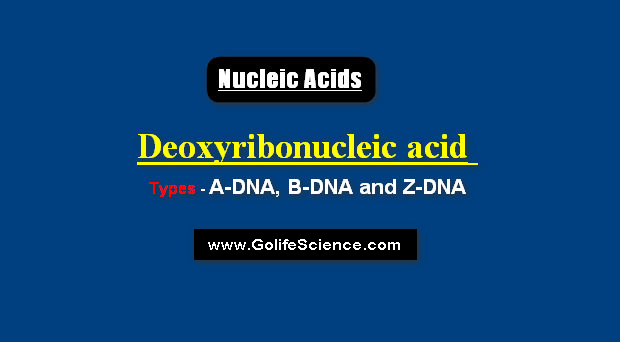 The deoxyribonucleic acid exists in three different forms. A-DNA is one of the many possible double helical structures of DNA. A-DNA is thought to be one of three biologically active double helical structures along with B- and Z-DNA. It is a right-handed double helix fairly similar to the more common and well-known B-DNA form, but with a shorter more compact helical structure. It appears likely that it occurs only in dehydrated samples of deoxyribonucleic acids used in crystallographic experiments, and possibly is also assumed by DNA-RNA hybrid helices and by regions of double-stranded RNA. A-DNA is fairly similar to B-DNA given that it is a right-handed double helix with major and minor grooves. However, as shown in the comparison table below, there is a slight increase in the number of base pairs per rotation (resulting in a tighter rotation angle), and a smaller rise/turn. This results in a deepening of the major groove and swallowing of the minor. The ability to predict macromolecular conformations from sequence and thermodynamic principles has long been coveted but generally has not been achieved. We show that differences in the hydration of DNA surfaces can be used to distinguish between sequences that form A- and B-DNA. From this, a “triplet code” of A-DNA propensities was derived as energetic rules for predicting A-DNA formation. This code correctly predicted > 90% of A- and B-DNA sequences in crystals and correlates with A-DNA formation in solution. Thus, with our previous studies on Z-DNA, we now have a single method to predict the relative stability of sequences in the three standard DNA duplex conformations. Narrower, more elongated helix than A. Look at this space-filling view of B-form deoxyribonucleic acid. The backbone is yellow and the bases are magenta. You can compare it with the other deoxyribonucleic acid forms by looking at this Red-Blue Stereo picture of A, B, and Z. Note that the major groove (at the top, when you have just clicked the button) is wide and easily accessible. Now change the display to make the show the sugar-phosphate backbone as “pseudo-bonds” connecting the phosphate atoms. Now the bases are easier to see. Notice how they are stacked upon each other and are nearly perpendicular to the axis of the double helix. Note also that the backbone forms a smooth, continuous curve. Zoom in on a few base pairs with this button. Hydrogen bonds between the bases are shown in white. You are looking into the major groove. Each base pair stacks on the next similarly, as shown from this view. A-form deoxyribonucleic acid also stacks in this way, but compare this with Z-DNA, which behaves much differently. DNA is usually found in the B form under physiological conditions. Sometimes kinks are found in the B helix at transcriptional control regions. These kinks can either be intrinsic to the DNA sequence or caused by transcription factor binding. Z-DNA is one of the many possible double helical structures of DNA. It is a left-handed double helical structure in which the double helix winds to the left in a zig-zag pattern (instead of to the right, like the more common B-DNA form). Z-DNA is thought to be one of three biologically active double helical structures along with A- and B-DNA. Z-DNA was the first single-crystal X-ray structure of a DNA fragment (a self-complementary DNA hexamer d(CG)3). It was resolved as a left-handed double helix with two anti-parallel chains that were held together by Watson-Crick base pairs (see: x-ray crystallography). It was solved by Andrew Wang, Alexander Rich, and co-workers in 1979 at MIT. The crystallization of a B- to Z-DNA junction in 2005 provided a better understanding of the potential role Z-DNA plays in cells. Whenever a segment of Z-DNA forms, there must be B-Z junctions at its two ends, interfacing it to the B-form of DNA found in the rest of the genome. In 2007, the RNA version of Z-DNA, Z-RNA, was described as a transformed version of an A-RNA double helix into a left-handed helix. The transition from A-RNA to Z-RNA, however, was already described in 1984. Z-DNA is quite different from the right-handed forms. 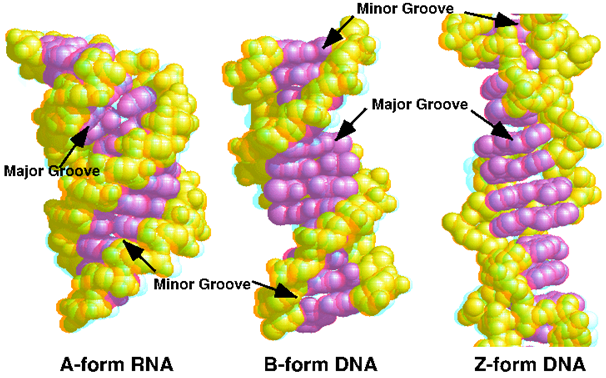 In fact, Z-DNA is often compared to B-DNA in order to illustrate the major differences. The Z-DNA helix is left-handed and has a structure that repeats every 2 base pairs. The major and minor grooves, unlike A- and B-DNA, show little difference in width. Formation of this structure is generally unfavorable, although certain conditions can promote it; such as alternating purine-pyrimidine sequence (especially poly(deoxyGC)2), negative DNA supercoiling or high salt and some cations (all at physiological temperature, 37°C, and pH 7.3-7.4). Z-DNA can form a junction with B-DNA (called a “B-to-Z junction box”) in a structure which involves the extrusion of a base pair. The Z-DNA conformation has been difficult to study because it does not exist as a stable feature of the double helix. Instead, it is a transient structure that is occasionally induced by biological activity and then quickly disappears.